The Kyrgyz president has won a “Newsmaker of the Week” nomination, and could also earn my “As free as the wind blows” sympathies. Despite being accepted as "a lame duck," he promised to protect his country until the inauguration of the president-elect. The Kyrgyz parliament, in its first reading, approves the denunciation of the agreement with Kazakhstan, according to which Astana was to transfer 100 million US dollars to Bishkek, letting the latter adapt to the terms of the Eurasian Economic Union (EEU). The incumbent President continued to escalate the conflict, which emerged prior to the presidential election in Kyrgyzstan, when Atambayev "hit" the head of neighbouring Kazakhstan’s Nursultan Nazarbayev for "imposing its candidate." As a result, Kazakhstan has prevented all produce from Kyrgyzstan to pass through its border, even in transit to Russia, blaming its EEU partner for its inability to stop the smuggling of goods from China. President Atambayev has even gone a little beyond - what other post-communist dictators would not have dreamed of, when endorsing a law that celebrates the anniversary of the uprising against the Russian Empire. Though it is one year later than a century anniversary, but Kyrgyz nationalists might have purred after the news emerged, while Russian patriots in the State Duma were left infuriated. The new law, naming 7 and 8 November the "Days of History and Memory of Ancestors", unites several important dates - the anniversary of the uprising against the Russian Empire of 1916, the anniversary of the Russian Revolution, and the Day of Remembrance of the Victims of Political Repression during the Stalin regime. It seems this commemoration of victims of bloodshed and "positive changes that have occurred in the life of the people in the Soviet period" would underline a bold statement by Kyrgyzstan, as a country requiring its partners in the EEU to accept its differences. And this is despite having nearly one million Kyrgyzstani people working and living in Russia. Surely, this step confused many people. But another blow came shortly afterwards. Kyrgyz produce is rotting at the Kyrgyz-Kazakh border or in the fields, as Kazakhstan plans to impose a ban on selling its coal abroad, pushing prices up in Kyrgyzstan, and drivers of cargo vehicles are expressing their rage for the absence of governmental support in the border blockade and the slow issuance of visas by China to deliver shipments to Kyrgyzstan. The Kyrgyz president, aware of the economic pressure caused mainly by the Kazakhstan blockade, has instructed the government to find alternative markets for Kyrgyz produce. "No need for a particular search. It is Uzbekistan with 32 million population and China with 1.5 bln population," the president says, referring to the sale of perishable agricultural products. He recommends businesspeople to send industrial goods to Russia by sealed railway vans. Atambayev is convinced that Kyrgyzstan must urgently build a new railway. "Every dark cloud has a silver lining. 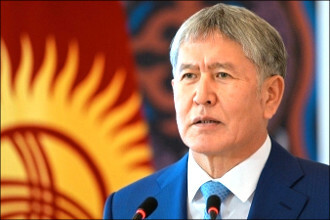 The latest events at the border showed the need for an urgent project and the construction of the China-Kyrgyzstan-Uzbekistan railway; then this road will go through Turkmenistan and Iran, with access to the Arabian Sea and the Indian Ocean," said Atambayev, as quoted by the Kabar news agency. Where would these decisions lead Kyrgyzstan? Would another week be able to show any progress? Just one month left before the inauguration of the president-elect, but he is still invisible. Or he is just a diligent power party nominee who has no claim to look independent. Uzbek president Mirziyoyev is diligent, too. He has so many things to do, but an association with the Russian oligarch, whether while using his plane for foreign travels or his family joining in celebrations, keeps him a little distant from what he promised earlier. The government continues to use forced labour in the cotton fields, but the process differs slightly; workers are "volunteering" to pick cotton, but still few options remain - "volunteer" or be fired from their main jobs (expelled from school). The Uzbek government is not less creative than the Kyrgyz; while securing its exports far beyond the former Soviet market, it engaged national celebrity stars to pick cotton and they, in their humble turn, began to encourage the Uzbek public to volunteer to pick cotton. Pictures full of glamour and happiness serve the success of Uzbekistan in trying to gain some dollars out of it. The Uzbek government hopes to diversify its income, too. The authorities have claimed Gulnara Karimova’s assets, which are frozen in European banks. The funds in question include 800 million Swiss francs (about $ 784 million). These are bribes Gulnara and her entourage received from telecommunications companies operating in Uzbekistan. Switzerland considers Uzbekistan's claims to be justified. However, it believes that the money (or part of it, if other applicants also prove their rights) can be returned, under controlled restitution, to make sure that the people would benefit from its use. Gulnara Karimova has been under house arrest for several years now. Her situation is connected with the conflict between the presidential daughter and some representatives of the leadership of Uzbekistan. In mid-2017, the Uzbek prosecutor's office stated that it had sentenced her to restraint of liberty, charging her with embezzlement and extortion. Gulnara Karimova's younger sister, Lola Karimova-Tillyaeva, has no fewer talents in glamour than her elder, Gulnara. Lola, promoting her perfume brand, The Harmonist, with boutiques in Paris and Los Angeles, found herself in art, too, with her environmental installation, named “The Droplet”. An American columnist found out that Lola is struggling to find a site for the installation in New York, and, despite refusals, "Lola is willing to make generous contributions to an institution that won’t blame her for the sins of her father and will provide a space for 'The Droplet'." Lola Karimova-Tillyaeva, along with her mother, is busy with the design, manufacturing and erecting the monument commemorating her late father - dictator Karimov died in 2016. Moscow Mayor Sergei Sobyanin helps a lot by ordering the monument to appear in the Russian capital. The Russian authorities are perseverant to satisfy demands of Uzbekistan to extradite openly gay journalist Ali Feruz (real name is Hudoberdi Nurmatov) detaining him, refusing to grant him political asylum, despite his birth in Russia and his family living there, and even refusing to issue him a travel document to leave to a third country (at least one European government came out to accept him). Ali Feruz has been awarded the Order of Courage this year, Award after Andrei Sakharov for "Journalism as an Act of Conscience" reports on its Facebook page. "The special services of Uzbekistan tortured Ali Feruz in an attempt to make him an informer - driving needles under his nails, but he did not give up - he managed to escape from 'Mordor'," the founders of the award stated. Uzbekistan sustains another blow against its "reforming" image by human rights activist, Malohat Eshankulova, who has held a protest in front of the US Embassy in Uzbekistan in Tashkent, requesting a political asylum in the United States because of increased pressure from the local authorities, which she links to her monitoring of the use of forced labour in the cotton fields, and demanding Prime Minister Abdulla Aripov to resign. In Turkmenistan, schools, with the intensive learning of different subjects, will introduce a fee of 100 manats ($ 28.5) per month for pupils of primary grades and 150 manats (about $ 43) a month for high school students, Alternative News of Turkmenistan (ANT) reported. Earlier, parents began withdrawing their children from nurseries, after the childcare fee grew tenfold. In Dashoguz, about 200 angry parents, while many of them carrying children, protested outside the city administration building. In the Mary velayat (an area in the south-east of the country), nurseries, according to Alternative News of Turkmenistan, are half-empty. Due to the decline in oil revenues, the Turkmen government approves a deficit budget. Public sector employees suffer wage arrears. At the same time, consumer prices are rising causing deficit of some goods. This week, the president awarded the officers of the law enforcement authorities, including his son, probably because they are his only loyal force in the country. Tajikistan has its economic success to celebrate. The state energy holding announced, that there will be no limits on the supply of electricity in the current autumn-winter period. The supply of electricity will not interrupt for the first time in more than 20 years. The reason is the country has built new small hydropower and heat power plants during this time, allowing to winter without limits for electricity. At the same time, the energy holding asks the population to carefully use electricity and pay bills in a timely manner. Some Tajik political opposition figures and their families still paying their "bills". Tajik citizen, Hafizamo Gadoeva, who is the cousin of the murdered leader of the opposition "Group 24" Umarali Kuvvatov and sister of the activist of this movement, Sharofiddin Gadoev, has appealed to the political leadership of Turkey requesting to protect her from the persecution of the Tajik authorities. Those people, who are trapped in Tajikistan, has no other alternatives but to plead the national leader. The family of arrested Abdumalik Salomov, a well-known cardiac surgeon in Tajikistan, appealed to President Emomali Rahmon asking him to facilitate an impartial hearing of the doctor's case. The authorities accuse him of having links with the religious movement "Salafia", banned in the republic. Kazakhstan is another country in the region, actively seeking its opponents abroad. The authorities want the opposition journalist, Zhanara Ahmet, issuing the international warrant. The journalist applied for asylum upon her arrival in Ukraine. Her request is still under consideration. It seems, Kazakhstan has already secured its economic development, and initiates another project of grandeur - abandoning its Cyrillic alphabet in favour of Latin. The president Nazarbayev approved the layout of the new Latin alphabet, and set 2025 as a deadline for a full change to Latin. The government explained its motivation by a willingness to join globalisation and access to technologies. However, it does not please the public in Russia, major EEU partner of Kazakhstan, although an official reaction is yet to come. After the powerful and sincere flamenco dance, applause must follow, but how Central Asia leaders are honest, while making statement and decisions? Another week would follow. We will see.